Sheer couture and elegance are two words to describe the Primrose Christening Gown. Designed by Linda Patrick, the gown reflects English summer days with its flowing lines and delicate hand embroidered primroses. 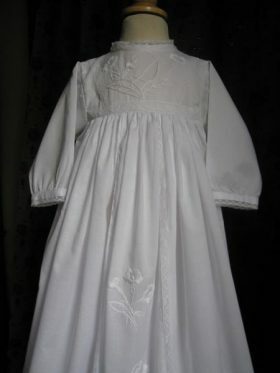 Although this christening gown shows primroses, Little Doves can incorporate any flower or motif into the design. 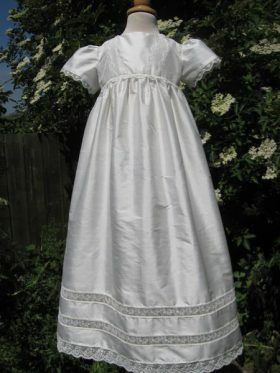 The gown is created from 100% pure English cotton lawn with cotton lace. Made from a silk dupion with its sailor look, the Edward Romper has a timeless quality that will never fade. The bodice has lovely lace detail with four antique sailor buttons decorating the front panel. The Edward Romper is also available with shorter legs, shorter sleeves. It can also be created without the collar if so desired. 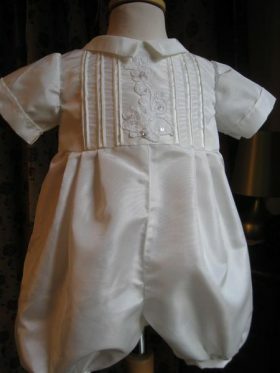 The Hayden Christening Romper is made from silk and has the most wonderful applique flower decoration on the front bodice. The bodice also features fine pintucks as well. A shirt collar and short sleeves with turn up detail compliments the design. Knee-length legs are pleated into the waist and fasten with poppers underneath. The Hemswell Gown is made from 100% silk dupion with Nottingham lace trim. 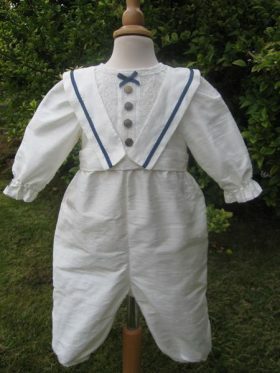 It is based on the styles of the Edwardian era when delicate yolks and horizontal panelling was the fashion. 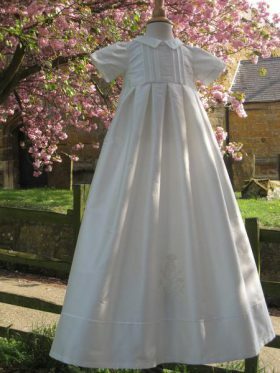 The Hemswell Gown is available in white or ivory silk. A Satin or cotton version can also be made on request. 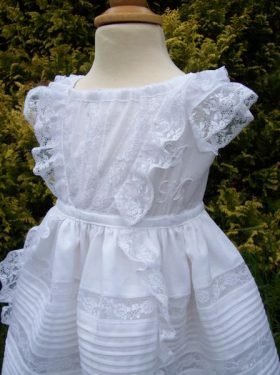 Easy to tailor to suit a boy or girl, the Birth Flower Christening Gown is created in 100% pure silk dupion and has classic lines. The bodice is decorated with vertical bands of pintucks and satin ribbon. Short sleeves with cuff detail and a small collar compliment the style. But the beauty of the gown lies in the skirt where your choice of flower is carefully embroidered using a variety of stitches to give this gown the Wow Factor.